Typically, you and your fellow students will watch a demonstration before having a go yourself – always with a tutor on hand to help and guide you. Courses typically conclude with everyone sitting around the table enjoying the fruits of their labour alongside a well-earned glass of wine, cocktail or hot beverage. At the end of each class, you can expect to leave with new skills, great memories, new friends and recipes to support your cooking at home. Learn to produce a well-presented, delicious, three-course dinner party menu and still have time to spend with your guests. This course will teach you the art of quick, effective entertaining. You will learn to cook a starter, main course and delicious dessert and how to present your food to restaurant standard. At the end of the course, you can relax and enjoy the fruits of your labour and a sit-down lunch with wine. During our Signature Experience, depending on the course length you will make a combination of two or three-course meal, together with bread and jam or chutney, depending on the season. As we use seasonal and locally-sourced ingredients, each Signature Day Experience is a unique event. If you would like to recreate authentic Thai, Mediterranean, Street, Indian or Japanese dishes at home, then we have a course with for you. Guided by one of our expert Chefs, you will be shown how to use authentic ingredients to produce those original flavours – we will also let you know where to buy the essential herbs and spices you will need to recreate these dishes in your own home. If, like many of us, you are short on time but don’t want to compromise on delicious evening meals, this is the perfect course for you. Using seasonal produce, we will teach you a repertoire of simple, nutritious and satisfying dishes that you will look forward to preparing, no matter how busy you are. 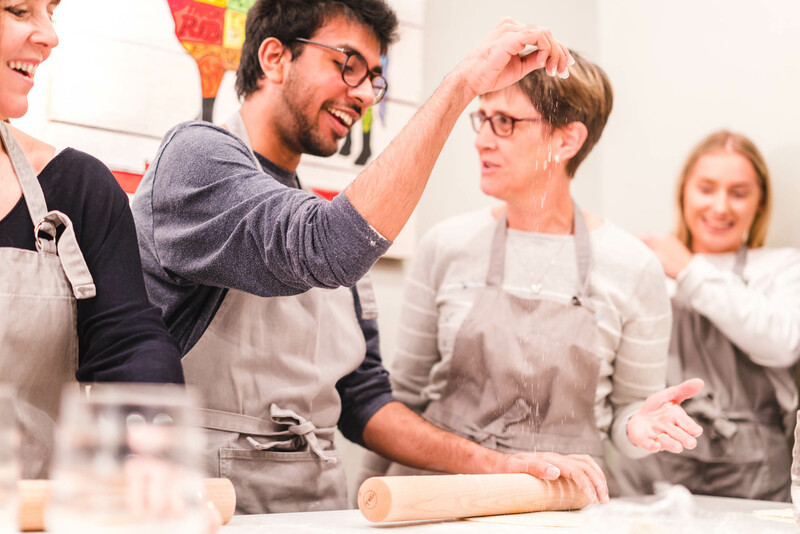 Whether you come to this course as a novice or with some experience, we will focus on honing and refining your pastry and baking skills with our range of sweet and savoury recipes. A course for chocoholics! You will gain knowledge and practice of working with milk, dark and white chocolate to create melt in the mouth moments and mouth-watering desserts. Forget the diet and indulge in a day of treats. Learn how to bake amazing treats that are gluten free. Using alternative ingredients, we will show you how to bake the bread, cookies and cakes that you thought you could no longer enjoy on a gluten-free diet. This course is a perfect introduction to delicious gluten-free recipes to ensure that you don’t miss out on your favourite bakes. Whether you know a little or a lot about beer, wine and spirits, our appreciation evening delivers an interesting and educational experience. Each session consists of several tastings (typically 6) accompanied by delicious, carefully-selected food, for example, tapas and Prosecco, canapes and wine. Each evening has a different seasonal theme and focus with the aim of showcasing the very best handpicked beers wines or spirits to ensure a fun and memorable evening for all. Our popular Knife Skills course forms the back bone of many of our courses and will improve the effectiveness and enjoyment of your day to day cooking. Knowing the best knife and technique to use will improve your speed, make you a safer cook and eliminate unevenly-cooked dishes and poor flavour development. Choosing a set of knives can be daunting. This course allows you to examine, handle and test different knives to make your decision easier. Crucially, you will learn how to look after your knives which will extend the life of your investment. Typically, you will learn essential vegetable preparation, slicing, dicing and julienne, before moving on to techniques such as fish boning, jointing and skinning a chicken and looking professional when carving the Sunday roast! The course may also offer a national theme with Thai, Mexican or French cookery. On this course, you will learn how to prepare and cook whole fish and shellfish to create mouth-watering dishes that are bursting with flavour and cooked to perfection. You will have the opportunity to use seasonal produce and/or to create a themed recipe such as a Thai or French fish dish. Perfect for those that like to entertain or simply up the repertoire at home, this course will give you the confidence to try new ingredients and techniques so that you can impress your friends and family with dishes that look and taste spectacular! The dishes will be seasonal and could follow these lines; duck breast with confit of prunes served with parmentier sweet potatoes, roasted tandoori lamb with bombay potatoes, pulled pork with a madeira jus, dauphinese potato served with wilted spinach, apples and pears. Knife skills form the back bone to this course as we breathe new life into old favourites, giving them a twist to bring them bang up to date. Using only British ingredients, you will learn how to produce the very best contemporary British food. These dishes will be seasonal and will differ with each course, consequently you cook look to be cooking a beef wellington, or toad in the hole, finishing off with profiteroles or eton mess. Nothing beats the aroma and taste of freshly-baked bread as it emerges from the oven. Learn how to make your own delicious loaves with our one and two-day courses. Join a small group of other would-be bakers for our fun and easy introduction to bread making. In a relaxed atmosphere, we’ll teach you traditional techniques in mixing, kneading, fermenting, proving and baking dough. Covering everything from everyday loaves to speciality breads, our courses are designed to appeal to new bakers and those with some previous experience. Return home and impress your friends and family with your new skills! These courses are full-day courses. Preserving is all about capturing a seasonal moment, holding on to summer fruits for as long as possible and making the most of the abundance of autumn. It’s also a wonderful way of ensuring that nothing you grow or buy goes to waste. Our seasonal series of preserving courses will equip you with all the techniques and tips you need to preserve your precious produce with confidence so that you can make enough cordials, jams, chutneys, pickles and liqueurs to last throughout the winter months. This class is ideal for vegetarians and vegans who love entertaining and sharing food with friends and family and would like to develop their vegetarian/vegan cooking skills further. We will show you how to create tasty, beautifully-presented, nutrition-rich recipes without animal products. As always, our chefs will be on hand to share top tips and ideas to take your vegetarian/vegan cooking to the next level. Refreshments on arrival will typically include either mocktails, soft drink, teas, coffee, and water. Typically, a glass of wine or beer will be served with the final meal. All participants must be able to use stairs.